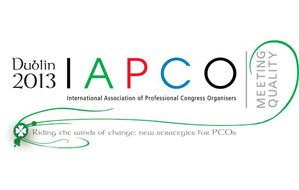 The International Association of Professional Congress Organisers (IAPCO) will hold its Annual Meeting in Dublin, 14th – 17th February 2013, bringing some of the industry’s leading lights to the shores of Ireland. The conference will be organised by Keynote PCO along with the two other Irish members of IAPCO, MCI Dublin and Conference Partners. The IAPCO General Meeting is held every year and the participants are drawn from top-level management working in the world’s leading Professional Conference Organisers. IAPCO now has more than 100 members in over 35 countries and is the largest association of its type in the world, with its members organising in excess of 5,600 meetings totalling over 2.11 million participants and more than half a million square meters of exhibits, representing an economic impact of over €3.43 billion.